These dye based stains have great color transparency and are highly fade and UV resistant. The deep penetrating nature of these alcohol based stains will not raise the grain of the wood and will dry in about one hour. 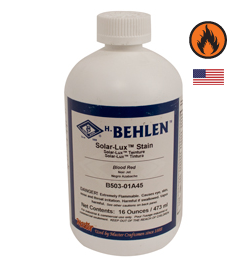 Solar-Lux Stains can be mixed to achieve customized shades. The color intensity can be lessened by thinning with Behkol Solvent offered below. After staining they can accept a finish coat of varnish, oil or conventional lacquer. Each bottle contains one pint.